Credit: 356469Jared C. Tilton/Getty Images Brett Moffitt, driver of the #16 Fr8Auctions.com Toyota, crosses the finish line to win the NASCAR Camping World Truck Series Overton’s 225 at Chicagoland Speedway on June 29, 2018 in Joliet, Illinois. 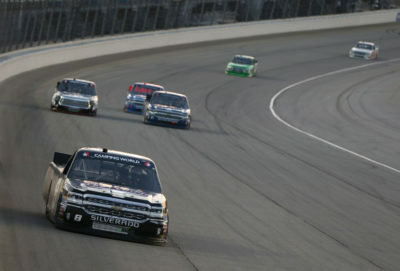 2nd Top 10 finish in 3 races at Chicagoland Speedway. It is his 6th Top 10 finish in 2018. 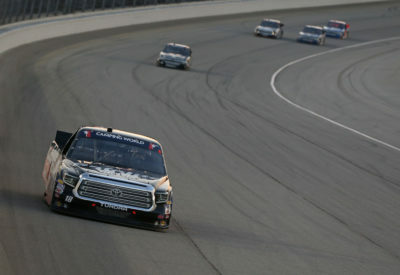 3rd Place Truck 21 Johnny Sauter ISM Connect Chevrolet, started from 7th place posted his 8th Top 10 finish in 10 races at Chicagoland Speedway. 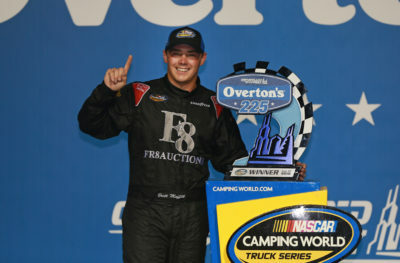 Credit: 356472 Matt Sullivan/Getty Images Brett Moffitt, driver of the #16 Fr8Auctions.com Toyota, poses with the trophy after winning the NASCAR Camping World Truck Series Overton’s 225 at Chicagoland Speedway on June 29, 2018 in Joliet, Illinois. 4th Place Truck 18 Noah Gragson Safelite AutoGlass Toyota, started from pole followed by 5th place Truck 51 Brandon Jones(i) American Standard/Eljer/Menards Toyota, started from 16th place. 6th Place Truck 24 Justin Haley Fraternal Order of Eagles Chevrolet, started from 10th place followed by 7th place Truck 8 John Hunter Nemechek(i) Essentia Water Chevrolet, started from 3rd place. 8th Place Truck 98 Grant Enfinger Champion Power Equipment/Curb Records Ford, started from 13th place followed by 9th place Truck 02 Austin Hill Young’s Building Systems/Randco Chevrolet, started from 14th place. Lastly in the Top 10 was Truck 13 Myatt Snider # Century Container Ford, in 10th place, started from 11th place was the highest finishing rookie. Johnny Sauter leads the point standings by 65 points over Noah Gragson. 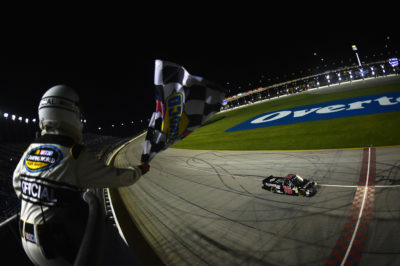 Tonight’s race is the 2nd NASCAR Camping World Truck Series race to finish with a last lap pass at Chicagoland Speedway – the previous race with a last lap pass for the win was in 2012 – James Buescher won. Credit: 356465Jared C. Tilton/Getty Images oah Gragson, driver of the #18 Safelite AutoGlass Toyota, takes the green flag during the NASCAR Camping World Truck Series Overton’s 225 at Chicagoland Speedway on June 29, 2018 in Joliet, Illinois. The race had 6 Cautions for 29 Laps: 1st Caution on lap 23 for #54 Spin Turn 4. 2nd Caution on lap 37 for Stage 1 Conclusion. 3rd Caution on lap 53 for #15 Crash Turn 4. 4th Caution on lap 61 for #25, 52 Crash Turn 2. 5th Caution on lap 72 for Stage 2 Conclusion. 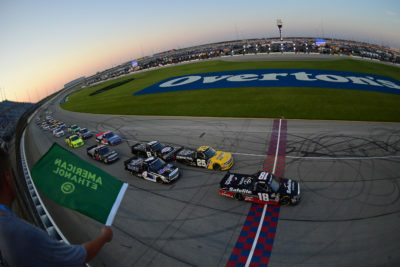 6th Caution on lap 122 for #3, 52 Crash Turn 2.
Credit: 356466Matt Sullivan/Getty Images John Hunter Nemechek, driver of the #8 Essentia Water Chevrolet, leads a pack of trucks during the NASCAR Camping World Truck Series Overton’s 225 at Chicagoland Speedway on June 29, 2018 in Joliet, Illinois. The Race had 17 Lead Changes among 6 drivers. Lap Leaders: N. Gragson 1; D. Sargeant # 2-25; N. Gragson 26-34; J. Nemechek(i) 35-37; N. Gragson 38; K. Forrister 39-40; N. Gragson 41-63; B. Moffitt 64; N. Gragson 65-72; J. Cobb 73; J. Nemechek(i) 74-87; B. Moffitt 88-97; J. Nemechek(i) 98-122; B. Moffitt 123-126; J. Nemechek(i) 127-135; B. Moffitt 136; J. Nemechek(i) 137-149; B. Moffitt 150;. 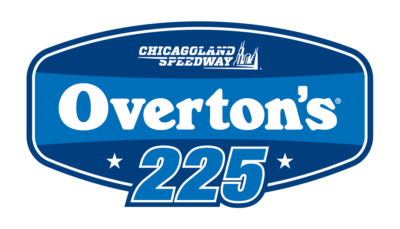 Leaders Summary (Driver, Times Lead, Laps Led): J. Nemechek(i) 5 times for 64 laps; N. Gragson 5 times for 42 laps; D. Sargeant # 1 time for 24 laps; B. Moffitt 5 times for 17 laps; K. Forrister 1 time for 2 laps; J. Cobb 1 time for 1 lap. Credit: 356467Matt Sullivan/Getty Images Noah Gragson, driver of the #18 Safelite AutoGlass Toyota, leads a pack of trucks during the NASCAR Camping World Truck Series Overton’s 225 at Chicagoland Speedway on June 29, 2018 in Joliet, Illinois. Race Comments: Prior to the start of the race, the following trucks dropped to the rear of the field under penalty for the reasons indicated: Nos. 49, 0 (unapproved adjustments). Failed to Qualify: N/A. Caution Flags: 6 for 29 laps. Lead Changes: 17 among 6 drivers. Average Speed of Race Winner: 119.346 mph. Time of Race: 01 Hrs, 53 Mins, 07 Secs. Margin of Victory: 5.092 Seconds. Duralast GT Brakes ?Brake in the Race Award? 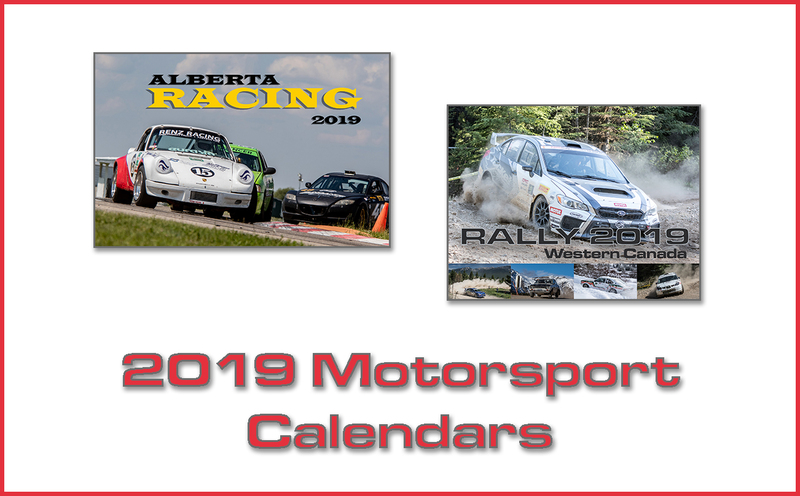 – Stage 1: John Hunter Nemechek, #8 Stage 1. Duralast GT Brakes ?Brake in the Race Award? – Stage 2: Noah Gragson, #18 Stage 2. Mahle Clevite Engine Builder of the Race: Joe Gibbs Racing Engines (JGE), #18. Mobil 1 Driver of the Race: Brett Moffitt, #16. Sunoco Rookie of the Race: Myatt Snider, #13.